For the past three decades, every year on the first Sunday of November, Sikhs from all over the USA converge on Yuba City, California, which reverberates with the spirit of sewa. A witness to the unique nagar kirtan, Asha and Ramesh Seth recount their experiences. 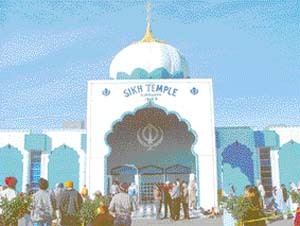 A view of the Yuba City Gurdwara. OF all the sights my wife and I witnessed during our long trips to America, the annual nagar kirtan of Yuba City in California was unique. For the past 30 years, it is held every year on the first Sunday of November to celebrate Gurgaddi Day of Sri Guru Granth Sahib. On that day at least 50,000 Sikhs gather there every year from all over America to take part in the mela. Yuba City looks like a place in rural Punjab at this time. 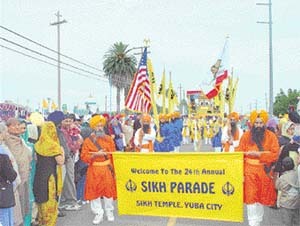 The Sikh population in Yuba City is about 10,000. Most of them are engaged in agricultural or horticultural activities. Peaches, prunes and almonds, etc are big crops. Fruit picking starts in July and lasts till September-end. In October the crop is stored and dispatched. Thus the mela, on the first Sunday of November, is in the nature of thanksgiving by the local Sikhs just as the Americans celebrate their Thanksgiving Day later in November. We arrived there a week in advance to imbibe the atmosphere. It enabled us to witness the preparation needed for such a big mela and later to take part in it. One week before the event those in charge of organising the mela started gathering at the gurdwara at 11 am every day. They would all sit in a group, out in the autumn sun, as the elders of a family sit in India before a wedding - reading newspapers, gossiping and whiling away their time. Those who were allotted specific duties attended to these. For others, it was vacation time when the problems of the world were far away. Right from Sunday, one week before the mela, an increasing number of devotees started bringing dry groceries to the gurdwara as a run-up to the big day. On an average day, only some of the devotees bring milk cartons, flour packets, juice containers, etc. But in view of the mela, now every one had something or the other in his or her hands. Coming to the gurdwara empty-handed seemed to have gone out of fashion during that week. Soon the quantity of offerings became more than the gurdwara store could hold. On Tuesday, five days before the mela, we found an empty 40-feet cargo container placed by the side of the langar hall to be used as a temporary storage area for dry groceries. During the course of the week, three similar containers were brought for the same purpose. The Sangat was fully alive to the fact that langar had to be prepared for 45,000 people and, therefore, brought sufficient groceries. Since Friday the sky over Yuba City was overcast. On Saturday it appeared that it might rain. I asked someone what if it rained on Sunday. "Don’t you worry," he said complacently. "It is Maharaj ji’s own function. The Guru Maharaj himself will provide succour." Sunday morning began with an overcast sky, but by 10 am the clouds had mostly cleared up. Soon it was a bright, mellow sunshine on that cool November day. The odd cotton ball clouds floated across the blue sky, lending additional charm to the scene. Guru Maharaj did provide succour. The first item on the agenda was to change the Chola Sahib of the Nishan Sahib. Amidst the recitation of Gurbani, the saffron flag was taken down and the seva done. After that the Nishan Sahib was hoisted again. Once again the standard of Sikh religion was gaily flying high above, beckoning the Sangat to the house of God. Thereafter, for the next one hour the Sangat stood all around with folded hands repeating the holy chant. Since early Sunday morning, the crowd had started pouring into Yuba City from all over America. There were at least 50,000 Sikhs who had gathered to take part in the mela. It was a sight to see. Men and women were dressed in colourful dresses; all in an exuberant holiday mood. The Yuba City mela is the grand daddy of all Indian melas in America. The langar hall was too small for this momentous occasion. Since langar could not be served to all inside, a large number of service tables were put out in the open. Piled up high upon these tabletops were containers of milk, fruit juices and soft drinks. I remarked that drinking water could run short, but milk, juices and soft drinks would never be in short supply. People took their plates and consumed food buffet style. Apart from Tierra Buena Gurdwara, the host gurdwara, some other gurdwaras as well had put up stalls to serve food and other eatables to the Sangat. One particular stall was serving only hot milk in a big karahi and freshly prepared jalebis. Feeding 45,000 people is not a joke. But with voluntary help and the spirit of seva uppermost in their minds, it was tackled efficiently. Over 2,00,000 meals are cooked over the weekend of nagar kirtan. The nagar kirtan started at midday. First, Sri Guru Granth Sahib was ceremoniously carried out from the gurdwara to the main float, which was a replica of the Golden Temple. The float is a permanent exhibit, built upon a large trailer. Even during the rest of the year, this one stays mounted on the trailer, and is housed in a specially built shed behind the gurdwara. 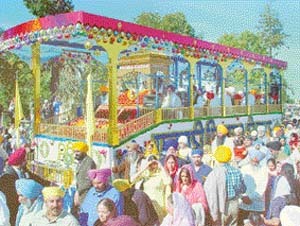 Various other Sikh groups from different areas of America, too, had put up their own floats. These followed the lead float in a long procession. The procession took four hours to complete its round of the city. All along the route the devotees had put up stalls to serve refreshments to the procession. No one wanted to be left behind in performing seva to the Sangat that had gathered from far and near. A Sikh does not easily let go of an opportunity to render seva to the Sangat. And here was an opportunity the likes of which came but once in a year. So their enthusiasm was unmatched. At the conclusion of nagar kirtan, the procession, led by the main float carrying Sri Guru Granth Sahib, returned to the Tierra Buena Gurdwara. The clouds had held. There were no rains. The entire programme went off without a hitch. Once again on November 6, 2005, there will be the mela but we shall not be there. We were lucky, however, to witness the mela at least once.